If you are looking for a cure for constipation, home remedies often work. Increasing the quantity of fibre- rich fruits and vegetables in your kid’s diet and drinking more fluids will also help. Laxatives are substances that loosen stools and increase bowel movements. They are used to treat and/or prevent constipation. 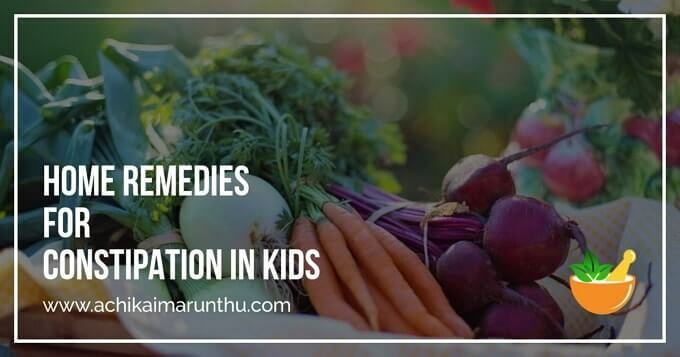 Here are a few Home remedies for constipation in kids under 6 months. Breastfeeding mothers include the following foods in your daily menu and continue feeding your baby. Peel, chop, grind the ginger and filter it. Take a pan to add the ginger juice, filtered palm jaggery and honey. Allow it to boil and then consume the warm ginger juice. Ajwain water-Soak ajwain in water overnight, next day strain the mixture and have the water. Place your fingertips on your babies belly button and massage in a circular motion. Moving your babies legs gently in a bicycle motion will help to ease bowel movements. Keeping your baby on his tummy also helps to increase bowel movements. Hot water bath can make the baby calm and reduce uneasiness. Take a pinch of Hing and apply it on your babies belly button and massage gently in a circular motion. Dip your fingertips in castor oil and apply it on your babies belly button and massage gently in a circular motion. Here are some Home remedies for constipation in kids above 6 months. Note: Do not overdo with any foods ‘ Too much of anything is good for nothing ‘. Do not force feed your kid as it may also lead to constipation. Rub kadukkai 4-5 times on a sandal stone and mix the rubbed extract of it with breastmilk/water and giver your baby using Sangu/paladai after the bath. Take the juice of 1 betel juice. Rub vasambu 1-2 times on a sandal stone and mix the rubbed extract of it with betel juice and giver your baby using Sangu/paladai after the bath. Offering your baby lots of fluids in addition to regular feedings will help to prevent constipation. Make sure your baby is well hydrated. Flax seeds are proven to be one of the best ways to relieve constipation. Ground Flax seeds into fine powder. Add a tsp of the ground flax powder to cooked vegetables, cereals and offer your baby. Dietary fibre in Barley helps to increase bowel movements. In a pressure cooker add ghee and cumin seeds. Once the cumin seeds start to pop add Barley, Moong Dal and dry roast them for few mins. Serve the warm barley porridge to your baby. Red banana contains lots of fibre. Fibre-rich foods are essential for regular bowel movements. Guava can be a best natural remedy for constipation but note if the seeds of the Guava are not chewed properly it may lead to constipation. The high fibre content in Apple helps to loosen up your baby’s stool. Pear juice/puree can be offered to your baby as it is fibre rich and it actually works. Orange juice can work well for constipation in kids as it contains dietary fibre. Instead of juice, you can also give the Orange pulp if your baby is ok with it. Papaya is a natural laxative rich in fibre which eases your babies bowel movements. Kiwi fruit is rich in disease-fighting antioxidants so it provides relief from constipation. Soak one of them overnight in lukewarm water. Next day smash the soaked fruit in the same water, filter it and offer your baby. Leaves of Pasalai keerai helps to relieve constipation. Cabbage is rich in fibre content and helps to relieve constipation. Beets are known for helping with digestive problems. Broccoli is a superstar source of fibre. Offer steamed/boiled broccoli to your babies. The opinions expressed in this post are personal opinions of mine. Each kid is unique in their own way. Some remedies may help some may not. So keep checking for allergies when you introduce a new food. Hey, thank you for your words. Keep reading! !